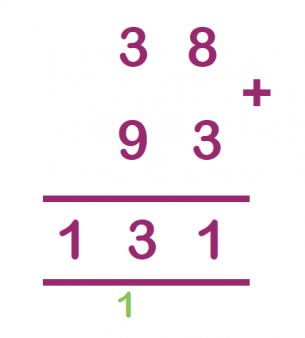 This is a quick and efficient method for working out addition and subtraction, but the downside is that a child could use this method without having any awareness of place value (that is: they would not understand that the 3 in the above number is not 3, but in fact 30). 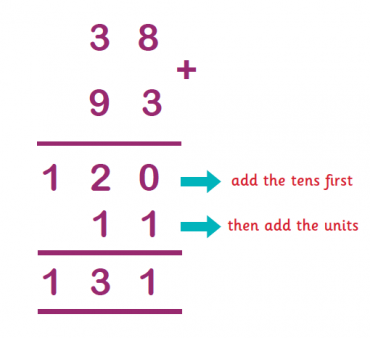 It also means that they are not learning to add and subtract multiples of 10 or 100 (for example: 30 + 90, 120 - 50 etc). In order to help children understand these concepts, teachers often use partitioning for addition and a number line for subtraction. Once children are aware of place value and also have the ability to mentally add and subtract multiples of ten and one hundred, they would probably be encouraged to move onto the column method involving 'carrying' numbers, as this is the quickest method. 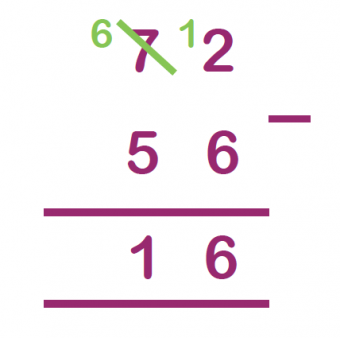 The new 2014 curriculum suggests that children should start by adding and subtracting three-digit numbers using the column method. They then move onto adding and subtracting four-digit numbers in Year 4, and then more than four digits in Year 5, always using this same method. The column method is also used in multiplication (also referred to as the long multiplication method).